Viewing posts with the tag 50th Anniversary. Show all posts. We finished our 50th Anniversary Salon Series on a high note December 1, when Dalia Tsuk Mitchell told the story of Felix Cohen, the "Father of Federal Indian Law" (1907-1953). The program was a collaboration between the Society and the Interior Museum, and took place at the Department of the Interior's magnificent New Deal-era auditorium. We learned about the evolution of Cohen's views on legal pluralism and the place of Native Americans and other minority groups in the United States, and how Cohen's experiences as a Jewish American shaped those views. Cohen is most known for his Handbook of Federal Indian law, still the standard source in its field today. A diverse group came out on a cold, cloudy day -- including many Interior Department employees, a group from Temple Beth Ami, other people from our and the Interior Museum's mailing lists, and even a man who once worked with Cohen. 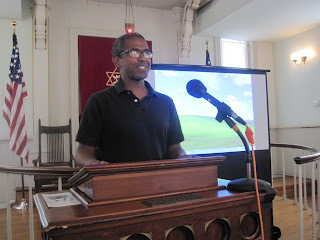 "The Indian plays much the same role in our American society that the Jews played in Germany. Like the miner's canary, the Indian marks the shifts from fresh air to poison gas in our political atmosphere; and our treatment of Indians, even more than our treatment of other minorities, reflects the rise and fall in our democratic faith." Special thanks to Diana Ziegler (pictured at left, with me and Professor Mitchell) from the Interior Museum for making this program possible. Check out Architect of Justice: Felix S. Cohen and the Founding of American Legal Pluralism , Professor Mitchell's award-winning biography, to learn more. On June 9, 1960, ten Jewish Washingtonians met in a living room to discuss founding a historical society that would help preserve the story of Jewish life in Washington. 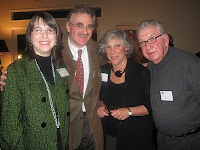 Each year since, the Jewish Historical Society of Greater Washington has held an annual meeting, an open session of the executive board. This year’s annual meeting, convened on November 14, was a particularly special one, as we celebrated our 50th anniversary. The Society used the meeting and the lovely space at Congregation Adas Israel, as an opportunity to showcase our progress over the past fifty years to the hundred and fifty members and guests who attended. Through banners, posters, photo albums, and objects, we looked back at some of our favorite exhibitions, guest speakers, and programs, as well as looked ahead at the impending synagogue move and where the Society is headed in its next 50 years. I certainly learned a lot in researching and reading the materials, and, judging by the lively conversation that followed the meeting, many of our guests were intrigued as well. We were fortunate this year to be joined by Marvin Kalb (pictured left), host of The Kalb Report and the last newsman hired by the incomparable Edward R. Murrow. In his keynote address, Kalb discussed the changes he’s seen in the Washington, DC area and in the journalism profession in the last 50 years. Most notably to his eye, the profession has been diverted from a focus on reporting news with honesty and respect to a focus on taking sides and being the first to break a story. During the board meeting portion of the afternoon’s festivities, we did take care of some necessary business, including voting on by-laws about the size of the board and term limits for the board president. We also elected a new slate of board members, appointed honorary directors, and bid a fond farewell to the departing members of the board. We look forward to seeing you at next year’s meeting—and to sharing the Society’s next 50 years with you!